Google Places looks different. It is cleaner, and there is a much bigger emphasis on user reviews and photos. And not just any reviews from all over the Web, but reviews written by Google users themselves. This should be a welcome change to third-party sources of reviews like Yelp and TripAdviser who have long complained that Google was building Google Places on the backs of their content while at the same time trying to replace them. 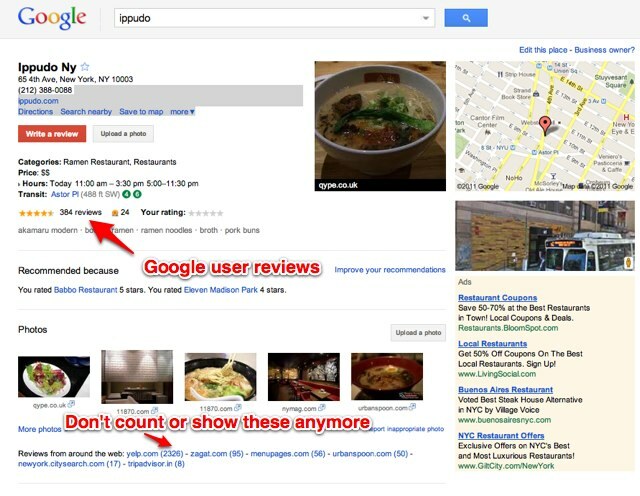 Now Google Places no longer shows those reviews on Places pages for a specific venue, nor does it count them in the total number of reviews which it shows for each place. Instead, it links to the reviews from sites like Yelp, Zagat, and Citysearch separately and breaks out total review counts for each site. For instance, the Google Places page for Paxti’s Chicago Pizza in San Francisco went from 1,110 reviews to 171 reviews after the non-Google reviews were stripped out. So why the big change all of a sudden? Well, after using reviews from other sites as a placeholder until now, Google Places now seems to have enough of its own reviews to stand on its own two feet, especially after incorporating Hotpot. It doesn’t need to borrow (to put it politely) so outside reviews anymore. And now there is a big “Write a review” button at the top of each Places page to encourage more user generated contributions. What he doesn’t mention is the back story to all of this. And here’s another tidbit. The change comes a week after Yelp made a presentation to a roomful of state attorneys general at the Conference of Western Attorneys General about regulatory issues in search. On that panel was Vince Sollitto, VP of Government Affairs for Yelp, along with Dana Wagner, a Google lawyer, and well-known antitrust attorney Gary Reback. Yelp’s presentation was titled “Google Places: A Threat To Innovation and Competition.” The basic argument was that Google strong-armed review websites into providing their content for free, and then gave their own Places product preferential treatment in search. Google’s stance before was that as long as Yelp and others were not blocking their sites from general search, which they were free to do, then Google could use the indexed content in Google Places as well. It was a take it or leave it approach. And now Google seems to have changed its tune.